The Kingdom of Lesotho, formerly a British protectorate known as Basotholand, became an independent nation in 1966 and is now a constitutional monarchy. 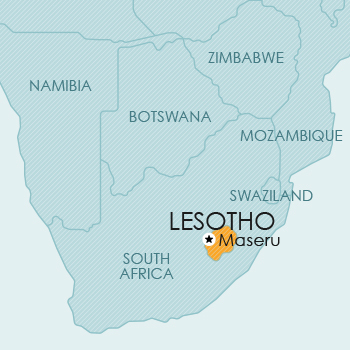 Lesotho is a land-locked country located in Southern Africa and completely surrounded by South Africa. Lesotho is a member of the Paris Convention, the ARIPO (Banjul Protocol), the Madrid Agreement and Protocol, and the WTO/TRIPS. The Order provides for the registration of marks in respect of goods and services, and for collective marks. Since Lesotho is a member of the Paris Convention, it is possible to claim priority on the basis of an earlier application in a convention country. Lesotho has also acceded to the Banjul Protocol of ARIPO, and to the Madrid Agreement and Madrid Protocol of WIPO. However, these treaties have not yet been implemented in the national trade mark laws of Lesotho, so that it is not clear whether valid trade mark protection can be obtained in Lesotho via an ARIPO application or a Madrid application designating Lesotho. Lesotho is a member of the Paris Convention, ARIPO (Harare Protocol), the PCT and the WTO/TRIPS. Patent protection is available via a national filing or an ARIPO application designating Lesotho. Lesotho has implemented the Harare Protocol (which regulates patent and design filings in ARIPO) in its national laws, thereby giving valid patent protection to applicants seeking to obtain a patent via an ARIPO application. The Industrial Property Amendment Act, 1997 amended the principal legislation by giving effect to PCT applications in Lesotho, but Regulations to implement the PCT provisions have not yet been promulgated. However, the existing legislation does contain a provision which states that any international treaties in respect of which Lesotho is a signatory shall apply in Lesotho and, in the event of a conflict between the national law and the international treaty, the provisions of the international treaty will apply. This means that international PCT applications, in which Lesotho is designated, may form the basis of national phase applications in Lesotho. Foreign applicants must be represented by an agent. Lesotho is a member of the Paris Convention, ARIPO (Harare Protocol) and the WTO/TRIPS. Design protection is available by way of a national filing or via an ARIPO application designating Lesotho. Lesotho has implemented the Harare Protocol (which regulates patent and design filings in ARIPO) in its national laws, thereby giving valid design protection to applicants seeking to obtain a design registration via ARIPO. Lesotho is a member of the Berne Convention, the Rome Convention and the WTO/TRIPS. illustrations, maps, plans, three-dimensional works relative to geography, topography, architecture, technology or science. Currently, no legislative provision for plant breeders’ rights or other sui generis protection for plants is available in Lesotho.